1481 entered service with Ribble in February 1980 as part of a batch of 30 buses, check delivery of which was spread over the period from August 1979 to February 1981. This would be extraordinary now but in those days of excess demand it was not that unusual. Like many others in the batch it went new to Carlisle and spent most of its working life there. It became part of the Cumberland fleet when they took over Ribble services in the city in early 1986 and did not leave until the beginning of 1993 when it was transferred to Ribble at Preston. The immediate reason for its transfer was that Carlisle depot received a large batch of Alexander bodied B10M’s at that time. By July 1996 it moved to Chorley depot where it was well looked after for the next few years and it eventually became the last Atlantean delivered new to Ribble to remain in service with them. All that changed with the Blazefield acquisition of Ribble’s East Lancashire services in early 2001. Many of Ribble’s older vehicles were dispatched to Blazefield and 1481 found itself at Burnley depot, rx mainly working schools services. With the arrival of the summer holidays and the influx of new Plaxton bodied B7TLs it was surplus to requirements. The RVPT acquired 1481 in July 2001. It was in very good mechanical condition and the bodywork was sound but it was tatty outside as Blazefield had painted out the Stagecoach stripes. 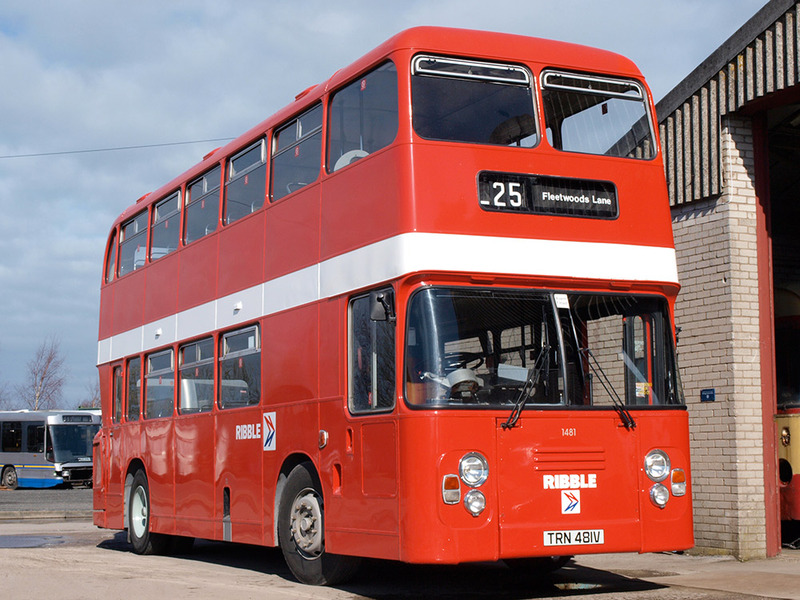 However, following some minor body repairs it went into the paintshop of Preston Bus and emerged looking immaculate in NBC poppy red complete with the double-N symbol. It has performed regularly since then at many RVPT events.